Isha teaches Hosh a simple, cheap recipe that not only looks & tastes restaurant style, but can also be easily modified. “Coriander coconut chutney,” Isha was saying as Hosh listened attentively, “is a combination chutney. Coriander chili chutneys are used more with North Indian spicy or deep fried preparations like samosa, pakora, Aloo bonda etc. because they flavor and flare up the spice." “Other very popular chutneys are those made with mint or mango. Chutneys are sides, so you can easily modify the quantities and preparation methods to suit." She gave him the Ingredients List as usual to file in his Recipes Folder, but had already assembled everything to save his time. “How many people will it serve Ma, and how long will it take to make?” asked Hosh. 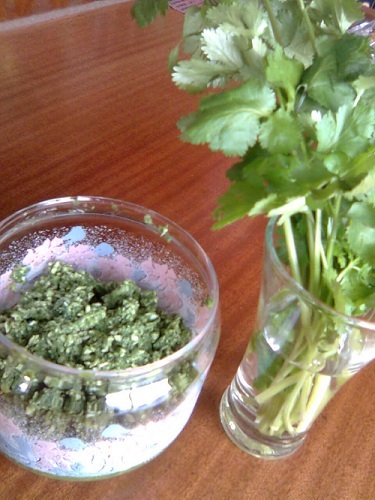 Hosh put the fresh coriander leaves in a measuring cup, pressing gently. Since they were using fresh coconut, Isha asked him to peel the brown skin off from its back first because it is hard and shouldn’t go in the chutney. They put all the ingredients in a mini wizz (or food processor), and blended until smooth. Hosh tasted it. The chutney had a raw taste of coriander. Their Somalian guests loved the well-presented chutney that was served with corn chips, potato chips, fries, pakoras and fish fritters as starters that night. They liked it so much that Isha served it again in mains with pita bread. With good food and good friends, their evening was fun as usual.